I have prepared a beta build of YafaRay 0.1.5 for Blender 2.73 for Windows 7 and Windows 8.1 (64 bit versions). Last edited by David Bluecame on Sun Mar 29, 2015 11:31 am, edited 2 times in total. It works well in my Win7 64bits, I have been able to test it with several scenes with no problem. Thank you. I hope more people can confirm it works so we can move it to the downloads page. 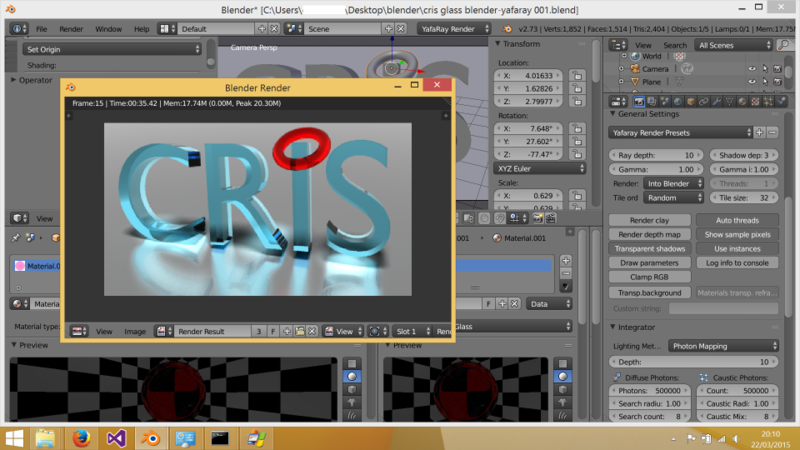 The only thing I'm not happy about this beta is that you have to copy some DLL to the Blender folder. I figured out how to fix that, but I would need to change a small part of Blender-Exporter python initialization code. Is that ok, Álvaro? hi David, thanks for these builds. I think we finally have good binaries for Windows users! About your proposal, do whaterver solution you think will require less maintenance and endure longer. The current system about installing the add-on through the Blender User preferences panel like any other add-on is good but only makes sense if Blender developers can keep the add-on system in good shape and does not break every two or three Blender releases. For instance, having to install DLLs in Blender folder is not the expected way for the addon system to work, from Blender developers perspective. Maybe we should consider going back to an installer if things are easier for us that way. As discussed, I have made two new builds (Beta2), one for 32bit and another for 64bit. Also, I've updated the download links acordingly in the "Testing Builds" part of the forum. The only difference is that it's no longer needed to copy manually any DLL to the main Blender folder. I hope it helps, best regards! I confirm it's working on windows 8.1 x64, and I just tried it with official blender 2.74 as well. works perfectly! afecelis wrote: This is great news! Thanks for the donation Álvaro. I hope I can keep on helping. Efforts like David's are very valuable and show how much a community supports and appreciates an initiative like Yafaray's. I wish for Yafaray not to disappear but to evolve according to nowadays renderers' standards.